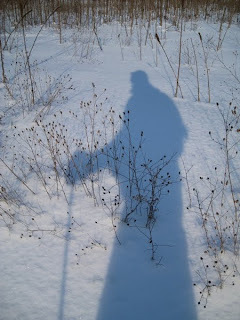 Soon, the mighty Sasquatch who haunts the sparkling white trails - aka me with my many layers of outerwear - will be glimpsed loping clumsily through the Michigan forests. Although we haven't been sprinkled with any snow yet in lovely Metro Detroit, it is freezing outside today (and not much better inside). I'm not quite in winter mode yet, so I've been revisiting last year, looking at pictures from snowshoeing weekends past, and thinking about exciting and chilly things to look forward to. Typically, my partner in all things winter adventure is my sister, Andrea. Always ready for a spontaneous trek through snow and prepared with enough survival equipment and provisions in her car to sustain a small community, Andrea is an ideal cohort. 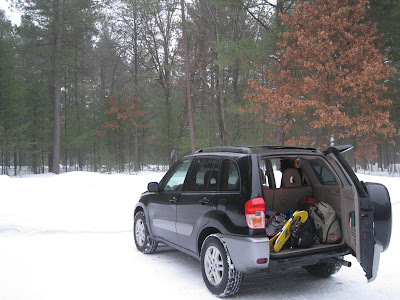 Were we to become stranded on a seldom-used logging road in the Upper Peninsula, we would be able to live comfortably in her Toyota Camry for quite some time. She even has a specialized tool to break the car window glass should we become submerged in an icy lake after sliding on a patch of black ice. Of course, most of these points are moot considering we usually take my larger vehicle; regardless, when we are together I rest easy knowing every scenario is covered. In Andrea's opinion, vast stores of knowledge and random skills should be acquired in the event of cataclysm or extreme boredom. Once, while camping in the Pictured Rocks area, she insisted upon attempting to start a fire by rolling a stick between her hands, intent on using the friction on the end of it to ignite a small pile of tinder. Despite my protests, she continued in this endeavor while I unloaded our equipment, started an actual fire in the provided fire ring, began cooking dinner and enjoyed a spectacular sunset over Lake Superior. Only when the scent of brats grilling over open flame proved too overwhelming to the senses did she relent, claiming that she almost had smoke, but needed to change into warmer clothes due to the 'sudden' disappearance of the sun. Last winter, Michigan experienced heavy snowfalls and temperatures in the single digits and teens for the first several weeks of the season. Andrea and I decided to travel to the Grayling area the first weekend in February to visit Hartwick Pines State Park and to check out the nearby Au Sable River Trail. When under several feet of snow, this part of the state is a popular destination and it is not uncommon to see much of the population getting around on snowmobiles instead of in cars. It strikes downstaters as funny that printed advertisements in much of Northern Michigan for restaurants, hotels, and other attractions often include driving directions for traveling by snowmobile. Naturally, a spontaneous warm-up tried to destroy our plans. 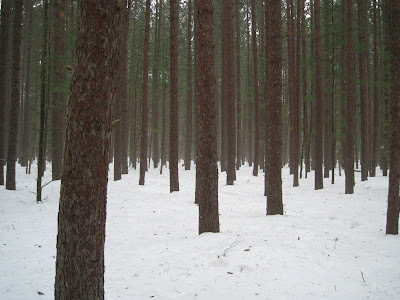 A solid month of below freezing temps and nearly constant snow was about to be thwarted by a freakish warm front; however, cold conditions prevailed throughout the first day for our visit to the Old Growth Forest in Hartwick Pines State Park. 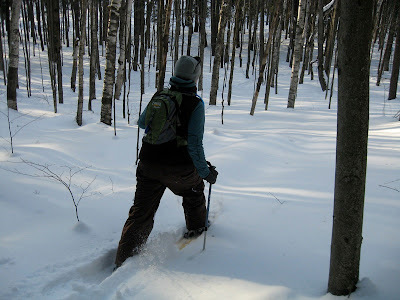 We found that the trail had been heavily groomed for Cross-country skiing and walking without the aid of snowshoes, so we took the advice of the DNR employee at the visitor center and ventured off-trail. Somehow we managed to spend 5 hours in this small section of woods, tramping through snow drifts, photographing large trees, and occasionally falling on our faces. We returned to the visitor center as the sun started to go down to find everyone had gone home. 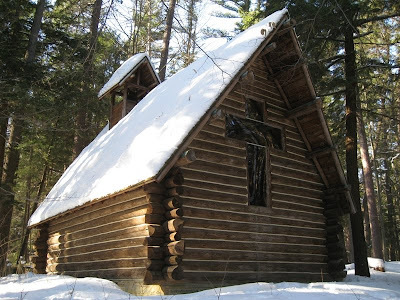 Overnight, the temperature began to rise, causing the air to be thick with fog when we set out for the Au Sable River Trail at 8:00 the next morning. Although the warm-up bummed us out a little and caused the thick blanket of snow to change from solid to gas practically before our eyes, the fog added an interesting element to that day's hike. 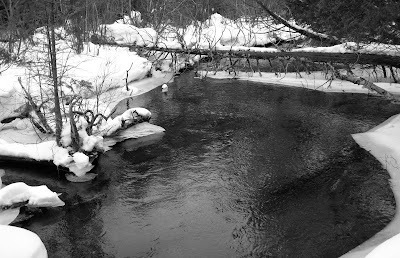 The Au Sable River Trail is one of the prettiest trails I have ever seen, and we hit the jackpot of first impressions by seeing it in winter. At the first of 2 river crossings, our minds were so blown by the beautiful scenery that we accidentally spent an hour there marveling at the view and taking photos from every angle. A lone cross-country skier from Lansing stopped to chat with us and said that she travels to that area as often as she can in winter just for this trail. She described it as mystical, and I could not argue. Back in Detroit, Andrea insisted on visiting a strange local phenomenon before heading back to her home on the west side of the state. 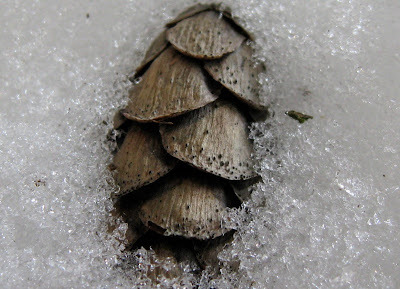 Last winter, one could find images of this mysterious oddity all over Flickr. 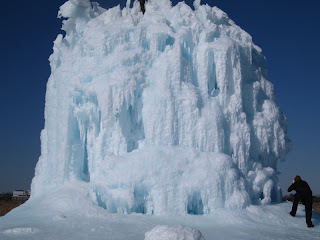 On Belle Isle in the Detroit River, a gigantic blob of blue ice formed and grew, attracting people for miles around. I tried to convince Andrea that while this enormous ice beast had once been magnificent, due to the warming temperatures, it must be a puddle by now. She was not to be discouraged, and we soon found ourselves driving across the Belle Isle Bridge in order to seek out this anomaly. Lo and behold, the majestic ice sculpture still lived, though it was smaller and kind of melty-looking. It was still pretty impressive, though, and I apologized for naysaying. 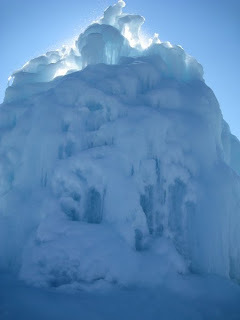 Next year, we will be better prepared to appreciate this frozen mountain while it is in the prime of its short life; however, the ultra cold conditions of last winter provided a special set of circumstances that might not be repeated again soon. My fingers are crossed for another spectacular Michigan Winter, but if the weather remains as quirky as it has been over the last month, I may be disappointed. 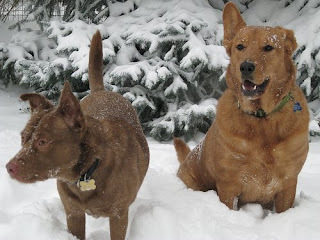 My dogs' coats can't decide what to do, and the pattern of shedding, thickening, then shedding again is driving me insane. I'm sure they are looking forward to games of 'catch the snowball', and so am I.
gorgeous photos - excellent post. thanks for sharing with us !! Happy New Year to All at Black Coffee at Sunrise !!! Thank you for such a lovely blog and amazing journies and great photographs and writing !!! we certainly appreciate and hope to see more in 2010 !!! Stay Toasty & Rock On !!! !